SAN JOSE, Calif. (KGO) -- Martin Jones made 22 saves in his second straight shutout and Tomas Hertl scored twice to give the San Jose Sharks a series lead for the first time in four trips to the Western Conference final with a 3-0 victory over the St. Louis Blues in Game 3 on Thursday night. Joonas Donskoi also scored to give the Sharks a 2-1 series advantage and move them as close as they have ever been to reaching their first Stanley Cup final. San Jose had won just three games in its first three trips to the conference final, part of a long history of playoff disappointment that is showing signs of coming to an end this season. San Jose has controlled the play for much of this series, limiting St. Louis' chances and taking advantage of miscues by the Blues to generate enough offense. St. Louis has gone 150:45 without scoring since Jori Lehtera's second-period goal in Game 1 led to a 2-1 victory. Game 4 is Saturday in San Jose, where the Sharks have won six straight playoff games. Brian Elliott allowed three goals on 14 shots before being pulled midway through the third. The Blues now find themselves trailing a series for just the second time this postseason. Overcoming this deficit may be tougher than coming back last round after losing the opener to Dallas. While the Stars were leaky on defense and rotated between two mostly ineffective goalies, the Sharks have done a stellar job defending in front of Jones, who has been sharp in his first postseason as a starter. After allowing the soft goal to Lehtera that led to the Game 1 loss, Jones has been perfect the past two games. He has stopped 58 straight shots and has posted the first back-to-back playoff shutouts in Sharks history. That kind of goaltending and another dominant performance from Joe Thornton's line was more than enough for San Jose. That line scored twice, with the first coming off a St. Louis turnover late in the first. Colton Parayko's breakout pass to Lehtera was broken up in the neutral zone by Brent Burns. Thornton quickly sent the loose puck ahead to Joe Pavelski, who found Hertl for a big slap shot that beat Elliott high to the glove side to make it 1-0 late in the period. Hertl scored again early in the third off a perfect pass from Thornton, ending Elliott's night. St. Louis coach Ken Hitchcock juggled his lineup after watching his team get outplayed the first two games. Centers Alexander Steen and Lehtera switched lines and Magnus Paajarvi and Dmitrij Jaskin suited up on the fourth line in place of Steve Ott and Scottie Upshall. On defense, Robert Bortuzzo got the nod in place of Joel Edmundson and Parayko moved up to the second pair with Kevin Shattenkirk. 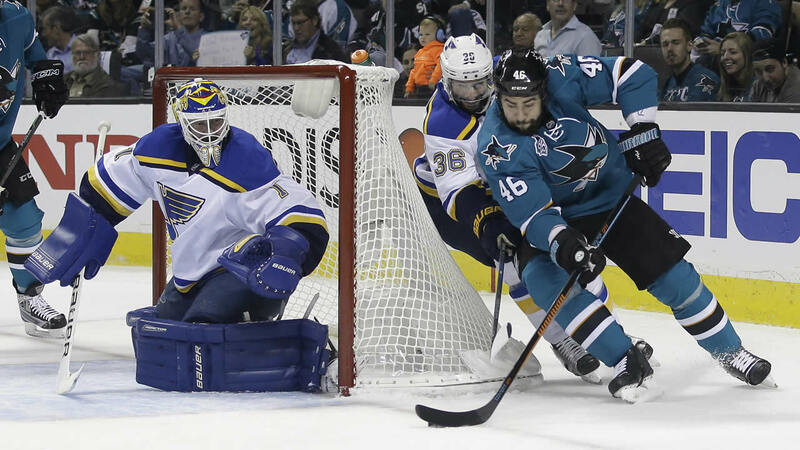 The Blues looked faster early and had the better of the play at the start, holding the Sharks without a shot on goal for more than eight minutes. But St. Louis seemed to lose some steam after Hertl's first goal. Matters only got worse in the second period. Donskoi broke up a pass from Robby Fabbri midway through the second to start an odd-man rush. Logan Couture skated into the offensive zone on a 3-on-2 chance and fed the trailing Donskoi for the wrist shot from the slot that made it 2-0.